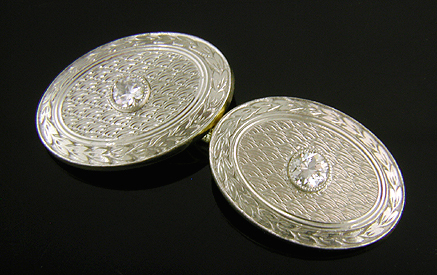 Irving Heidelsheimer diamond and platinum cufflinks, circa 1920. I hope everyone is enjoying the best of the Holiday Season and anticipating a happy New Year! December is traditionally the month I try to tie up some of the loose ends cluttering my desk. In that spirit this note relates to the "TH" maker and a recently acquired pair of Heidelsheimer cufflinks. Several months ago I wrote about "mystery makers" - makers of fine cufflinks about whom we know little beyond the elegant cufflinks they created. One of these unidentified makers is known as the "TH" maker. The sparkling platinum and diamond cufflinks pictured above may shed some light on this mystery firm. 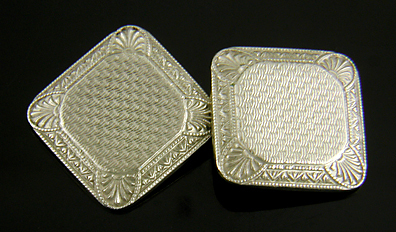 The TH maker created elegant double-sided cufflinks during the 1920s and 30s. 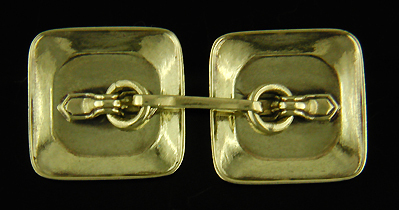 The above cufflink is a wonderful example from the early Art Deco period. The cufflink features stylized anthemion (palmette) corners with water lily borders surrounding intricately engine turned centers. The TH maker earned its nickname because of the maker's mark found stamped on the cross bars of the cufflinks - a "T" atop an "H". Beneath the maker's mark a "14" indicates the purity of the gold. The TH maker created cufflinks in 14-karat white and yellow gold. Reverse of TH maker anthemion and water lily cufflinks. In addition to elegant design and the maker's mark, the cufflinks of the TH maker are also characterized by distinctive cross bars and brackets. The brackets resemble a small bow tie with the edge outlined with an incised channel. The cross bars have tapered waists and elongated, teardrop-shaped eyelets. When the maker's mark is obscured, the distinctive brackets and cross bars can aid in identification. At the beginning of this note a glittering diamond and platinum cufflink created by Irving Heidelsheimer around 1920 is illustrated. Irving Heidelsheimer (succeeded by Irving Manufacturing Company) was a maker of fine gold jewelry and cufflinks during the early decades of the last century. The firm like many of the fine cufflink makers of the day was based in Newark, New Jersey. 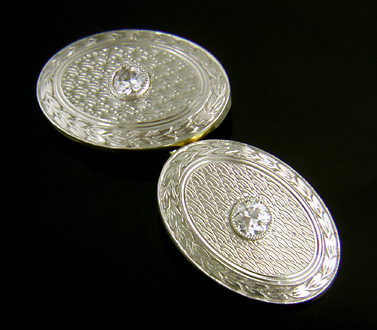 Reverse of Heidelsheimer platinum and diamond cufflinks. 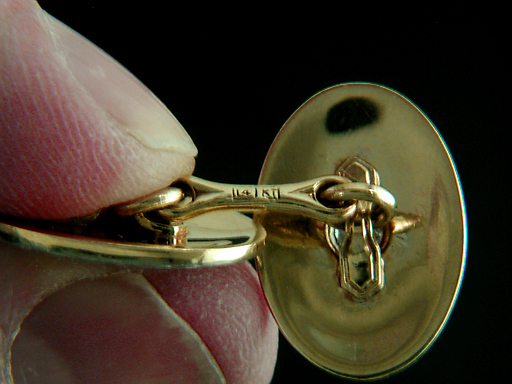 Like the TH cufflink, the reverse of the Heidelsheimer cufflink was crafted in 14kt yellow gold. Even more interesting, the brackets and cross bars of the Heidelsheimer cufflink show a marked similarity to corresponding hardware of the TH cufflink. Both cufflinks feature the same bow tie style bracket with an incised line shadowing the edge. In addition, the cross bars of the two cufflinks are similar in design with tapered waists and elongated, teardrop-shaped eyelets. A close-up of the cross bar and maker's mark of the Heidelsheimer cufflink is shown below. Close-up of Heidelsheimer cross bars and maker's mark. 1. Perhaps, the TH maker was a successor firm to the Irving Manufacturing Company (successor to Irving Heidelsheimer). During this period it was not uncommon for one jewelry firm to absorb another and then continue the designs and patterns of the latter. 2. Or, possibly, Heidelscheimer and the TH maker were one and the same. The "TH" could have been an alternative maker's mark adopted by Heidelsheimer to better fit the small area afforded by the tapered waist of the cross bars. The "H" might have signified "Heidelsheimer". But, then, what of the "T"? 3. A third possibility is that the cross bars and brackets were created by Heidelsheimer and wholesaled as findings (jewelry components) to other jewelry makers. Patent illustrations from 1916 indicate that the Heidelsheimer firm was using this style of crossbar from at least the mid teens. Unfortunately the illustrations don't provide a clear view of the brackets. Each of these possibilities is no more than speculation. Each points to a direction of further research, but does not currently provide any answers. When researching antique cufflinks answering one question usually leads to several more. Uncovering one clue leads to another mystery. Such is the endless fascination and mystique of antique jewels. Thank you so much for posting about the mysterious "TH" cufflink! My father un-earthed a gold cufflink engraved with "TH 14" back in the early 80's. I searched the internet for so long and was very excited to come across you post. Thank you from us both! You're welcome. That is exciting about your father's original find and your ongoing research.